The Department of Health’s digital strategy was published in December 2012. 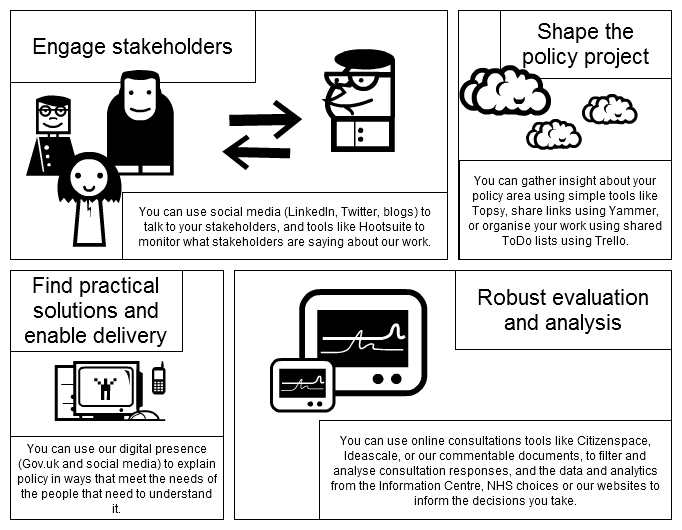 The strategy describes how staff will develop the knowledge, skills and confidence to make use of digital techniques to help develop better policy. The strategy commits the department to providing training and resources on the best digital techniques to engage audiences. Our commitment to the digital agenda is part of a government wide programme of work to ensure that the Civil Service is making best use of digital tools whatever discipline they work in. In his blog, Sir Bob Kerslake states digital as one of his four priority areas for which Civil Servants are to be skilled in, alongside commercial, programme and project management, and leadership and management of change. In the strategy, the digital team commit to helping others use digital tools in their day-to-day work. Our aim is for everyone in the department and its arms length bodies, to use digital tools and techniques routinely in their work. Policymakers should be able to make use of digital tools and techniques at every stage stage of the policymaking process. Click on the below image for some examples of this. The above gives some examples of how you can use digital tools across the policy making process, it is not a complete list. The best way to find if something works for you is to give it a go, you can always stop something if you find it doesn’t work.For more advice on digital tools and skills, keep an eye on the digital health blog, speak to someone in the DH digital team and see what training is currently on offer. For access to Citizen Space contact the DH digital team. All the other tools mentioned are freely available online.